Launching a sales campaign is a great tactic successful sales managers employ when making an end-of-year push for those quarterly targets. It rallies teams around a specific, short-term goal that’s normally linked to larger yearly objectives. Alternatively, sales campaigns can look to take advantage of temporal or seasonal trends within an industry such as summer, Black Friday and Christmas. A set of targets organized around a specific, often temporal sales objective within a limited timeframe. And it’s this timeframe that sets a sales campaign apart from regular “sales work”; it provides rep’s with an enticing opportunity to sell and customers with an incentive to buy. What is the sales campaign process? The first thing to ask yourself when setting up a sales campaign is why you’re doing it, what do you hope to achieve (objectives) who is going to execute it and for how long will it run. So let’s start with the first question – why? Why have you decided to run X campaign? Are you aiming to take advantage of a seasonal holiday such as Thanksgiving or Christmas? Do you believe there will be heightened interest in your product or service as people flock online looking for deals? There must be a good reason for you setting up a sales campaign before you dive in. Before making the choice, I’d definitely dive into your CRM to see if there’s any crossover between sales peaks and certain times of the year. If there’s precedence it could be a good indicator as to whether or not it’s worth going ahead with your sales campaign (plus data-backed decisions are always better than simply going with gut-feeling). If you don’t have any real-time sales data available you could try using a tool such as Google Trends. As you can see from this quick search for “turkey” there’s a peak beginning to form at the end of October, rising sharply as we run into November. This is then followed by another, shorter peak towards the end of December. It’s probably safe to assume the first peak can be attributed to Thanksgiving, as everybody starts to shop around for the nearest supplier of the festive bird and the second is likely to be Christmas. To make this specific to your sales campaign try searching for a keyword associated with your product or service and look for any peaks in interest. This should help your further narrow down on a timeframe with the highest probability of success. Once you’ve determined there’s a good enough reason to go ahead and launch a campaign, it’s time to set some objectives or specific goals for sales reps tasked with executing the campaign. These goals and objectives will not only serve as an indicator for the success of your sales campaign (they’re what you’ll use to measure your field team’s performance against) but will also act as guideposts along the way. For example, if you set your team a goal of selling $10,000 worth of product over a 3-4 week period, and after 2 weeks they’ve only managed to sell $3,500 they can see that if they want to hit target they’d better get a move on! I recommend that you apply focus when setting sales campaign objectives and be specific with the numerical results you expect. It eliminates any grey areas around what constitutes a successful campaign and gives your field reps a clear target to aim for. Who is going to execute the campaign? The next step is to decide on you will task with carrying out the campaign. If it’s a regional sales campaign, then it might only be appropriate for the manager and team in that territory. If it’s targeting a particular vertical, then you will need to speak to area sales managers with clients in that particular industry. It might seem overly straightforward, but it’s important to know exactly how many people will be working the campaign to better understand how the objectives can be broken down. The final step is decide on the duration of the campaign. Again, this will be determined by its overall objective and whether it’s seasonal or not; if it is, the timeframe will be predetermined for you. Ideally though, sales campaigns should be run over a short timeframe to maintain motivation among the team. They need to be long enough to see the desired impact against your objective, but short enough that your field sales team stay engaged. A daily sales campaign is obviously too short and weekly campaigns are on the lower end of acceptable too, so you’re looking at something between a month and possibly a quarter. Now that you understand the steps that underline the sales campaign process, let’s take a look at some possible sales campaign ideas. One of the most common that we touched upon earlier is a temporal or seasonal campaign. This doesn’t have to be Thanksgiving or Christmas, but refers to any period of time in your industry where there may be a natural increase in demand for your product or service. Like we mentioned earlier, this can normally be found by taking a closer look at your sales manager reports from the previous year. Any spikes in revenue or increased sales of a certain product or maybe upsell service should be circled and looked at in more detail – it could highlight a seasonal trend within your industry. Another popular sales campaign idea is to target events in your industry. There a popular option as there will always be a natural buzz you can work off to feed into your campaign. For example, if you are in the medical device industry you might want to set up a sales campaign that specifically targets attendees of HIMSS (if you are in the US) or the MedTech Innovation Summit if you’re in Europe. DURATION: Starts 3 weeks before event and ends 2 weeks after (total 5 weeks). So your company introduces a popular, brand-new product to the market that customers have taken a real shine to. Sales are up, your customers are happy and your bang on target to hit your quarterly sales forecast. However, with all the buzz surrounding the new product launch you still have a ton of stock sat in a warehouse gathering dust…but how do you motivate your team to sell a product without drastically slashing its price? That’s where a sales campaign comes in handy. Although it’s unrealistic to expect your team to sell-off their entire quota of old stock at face value, a short, focused campaign with the right incentives could literally turn that dust, to revenue. Another sales campaign idea you could look at is new territory business. One of the roles of area sales managers is to extract as much revenue from their territories as possible. Now while the majority of your field sales revenue might come from existing customers (account management) new business acquisition is a channel that shouldn’t be ignored. Let’s use our example from the medical device industry again. You are the territory sales manager and notice a series of new hospitals have opened up in your eastern and northern sectors. To your knowledge they are yet to speak to any of your competitors. However, your field sales reps in those sectors are hardened account managers, unaccustomed to prospecting and acquiring new business. So you’ve got a bit of a challenge on your hands. How can you pry them away from their existing customers and redirect focus towards generating new business? Now that you are armed with a solid sales campaign process and have various ideas rattling around about which areas you can target, it’s time to look at sales campaign management tools and execution. Most field sales teams have some type of mobile sales management system in place to help with the general running of things; creation of weekly sales report, route planning, sales visit follow-ups, team activity etc. 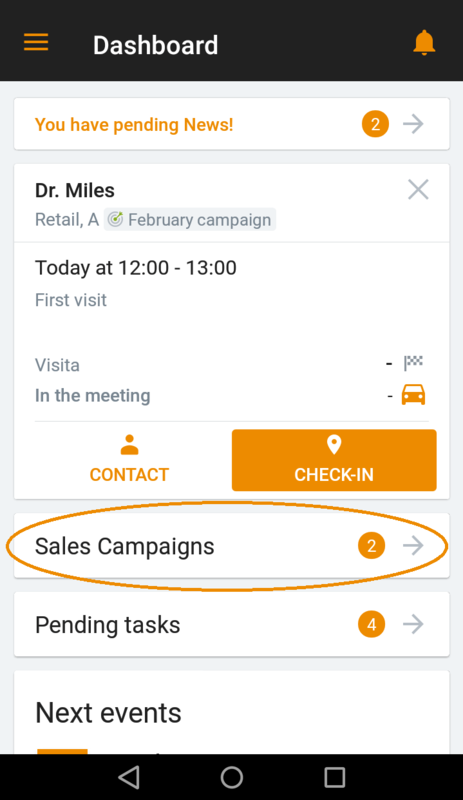 However, while a standard mobile CRM could potentially be used to track the progress of a campaign, ideally you’d want a system with a built-in sales campaign management module. What’s more, because the module is integrated with your CRM it’s incredibly easy for you to monitor its progress from a single dashboard. Not only that, but field sales reps have quick access to sales campaigns on their mobile devices, where they too can monitor their individual progress and that of the rest of the team. This monitoring capability also comes in helpful with the campaign’s execution. Most sales campaigns require additional effort on the part of the field sales representatives. This means that if you want the campaign seen through to the end, you’ll have to find a way to provide additional incentive to your team. One possibility is to offer a cash bonus to everyone who hits their objective. However, for cash-strapped businesses this isn’t always a viable option. Therefore you might want to look at running an internal contest with a single prize. It still provides the necessary enticement to push reps that a little bit harder (name me one sales rep who isn’t naturally competitive) without breaking the bank. Finally, once your sales campaign has run its course it’s time to sit down and analyze the results. Again, if your mobile CRM has a built-in sales campaign module this is incredibly easy to do – simply export the data into an excel grid, pdf. or to whatever your desired format might be. If not, you could try exporting a custom sales report with the allotted fields segmented to mirror the activity of your campaign. Once you’ve acquired this information, it’s time to determine whether your campaign was a success or not. If your team managed to achieve all their sales objectives, great! Ask the yourself (and the team) why the campaign went so well and how this could be replicated in the future. If they were unable to achieve their targets you still have to through the same process. Why was it unsuccessful? Were the targets set too ambitious? Were the number of face-to-face visits made too low to positively affect the campaign? Did this campaign perhaps expose some areas of weakness in the team that need to be dealt with through some selling skills training? Whatever it might be, a thorough analysis of the sales campaign is still going to be required. In conclusion, sales campaigns are a great tool in an area manager’s armory for applying a team’s focus to a specific objective. If properly motivated and working under the right temporal conditions, sales reps can drastically increase their chances (and yours) of hitting those quarterly or end-of-year targets. Want accurate, concise sales reports?